Allow the mixture to marinate 30 minutes before serving, but not longer as the grapefruit will “overcook” the fish. You will notice that the salmon will become more opaque as it marinates. I like to serve it in individual parfait glasses for an elegant presentation and garnish with the remaining tablespoon of cilantro and bits of zest. This dish pairs well with a chilled glass of Sauvignon Blanc from New Zealand. Slice the salmon against the grain into thin 2-inch long strips or hunks. 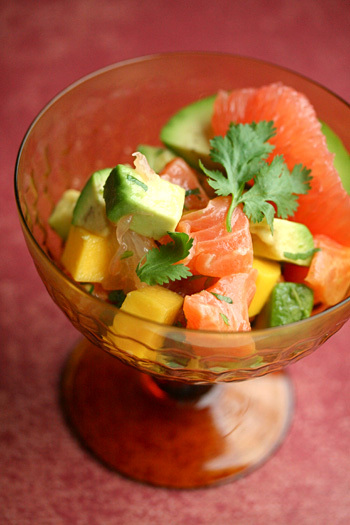 In a large bowl, gently mix grapefruit sections, avocado, mango or cantaloupe, cilantro, oil and salt. Marinate 30-40 minutes. Garnish with remaining cilantro and zest if using. Serve immediately. Nutritional Stats Per Serving (3/4 cup): 157 calories, 2 g protein, 19g carbohydrates, 9g fat (1 g saturated), 1 mg cholesterol, 4g fiber, 302 mg sodium.